He played symphonic, opera and chamber music, worked with different orchestras, such as the Orchestra of the Teatro La Fenice of Venice, the Arena Orchestra of Verona, “Teatro Verdi” Orchestra of Trieste, the Chamber Orchestra of Padova, the Orchestra of Mantova, and others. He also collaborated with the Kremerata Baltica of Gidon Kremer. He graduated at the Music Conservatory “B. Marcello” of Venice, having privately studied with Franco Marzorati. 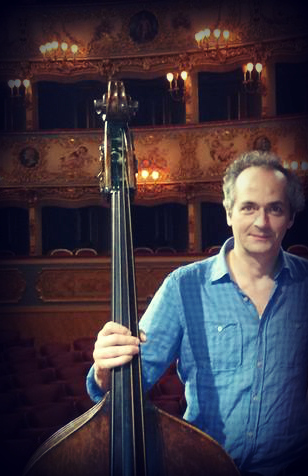 Since 1996 he is part of the Italian String Orchestra grounded by Mario Brunello. In Venice, since many years he is among the most active Vivaldi and baroque music performers. He also developed interest in contemporary music and performed as soloist with Orchestra, pieces by Luca Mosca and by Sylvano Bussotti with the Ex-novo Ensemble. He recorded for Naxos, Radio3, Stradivarius, Japan Victor.